Kolkata: Delhis Honey Baisoya recovered well after a slow start to fire a second straight six-under-64 that gave him the halfway lead at the inaugural Bengal Open Golf Championship at the Tollygunge Club, here on Wednesday. Baisoya, a six-time winner on the PGTI, was one clear of the rest of the field at 12-under-128. It was a crowded leaderboard as there was a four-way tie for the second spot at 11-under-129 between Delhi's Rashid Khan (64), Bangladesh's Badal Hossain (66), Chandigarh's Karandeep Kochhar (66) and Faridabad-based Karan Pratap Singh (67). The day's best round of 63 was posted by Delhi's Himmat Rai, Bengaluru's Trishul Chinnappa and Sri Lankan N Thangaraja. While Himmat occupied tied sixth place at 10-under-130, Trishul was tied ninth at nine-under-131 and Thangaraja tied 20th at six-under-134. The cut went at two-under-138 and 51 professionals made the cut. Honey Baisoya (64-64) jumped five spots from his overnight tied sixth, thanks to his dogged 64. Honey, who won his last event about a year back, dropped an early bogey on the first where his drive found the trees. The 22-year-old Baisoya was one-over through four holes before he charted a splendid recovery with consecutive birdies on the fifth, sixth and seventh. Honey missed an ace on the sixth as his magnificent tee shot stopped inches from the hole. After another dropped shot on the eighth, Baisoya hit top-gear on the inward nine with five birdies, courtesy some accurate drives and approach shots. Honey said, "I've shot two rounds of 64 but I would rate today's round better as I started from the front-nine, which has some tough holes at the beginning especially the first and the third. I got into my stride on the back-nine today as I created a lot of chances by consistently hitting the fairways. Rashid Khan, the winner at Chittagong last week, moved up from tied 12th to tied second, thanks to another flawless round. Incredibly, five of Rashid's last six rounds have been bogey-free. 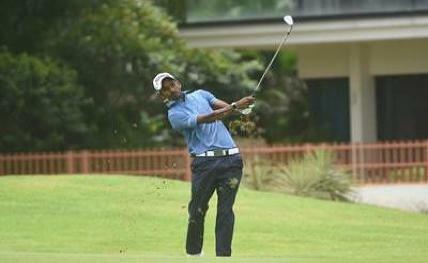 Badal Hossain continued in tied second position having traded five birdies for a bogey. Karandeep Kochhar also hung on to joint second place for the second day running. Round one leader Karan Pratap Singh slipped to tied second after mixing five birdies with a double-bogey. The rookie's sharp short-game saw him make some quality chip-putt birdies and four long putts to save par. Himmat Rai began the day with birdies on his first three holes, including a chip-in on the 12th. He was seven-under through 10 holes but then stumbled with bogeys on the second and third. However, he managed to pull it back by picking up two more shots thereafter and thus recording the day's joint best round. Among the prominent names, Bengaluru-based Rahil Gangjee (67) occupied tied 16th at seven-under-133, while Indian star and local favourite SSP Chawrasia (65) was in tied 20th at six-under-134. Incidentally, SSP's nephew Sunit Chowrasia (71), who was overnight tied second, also ended the day in tied 20th place. SSP and Sunit will now be playing in the same group in round three.